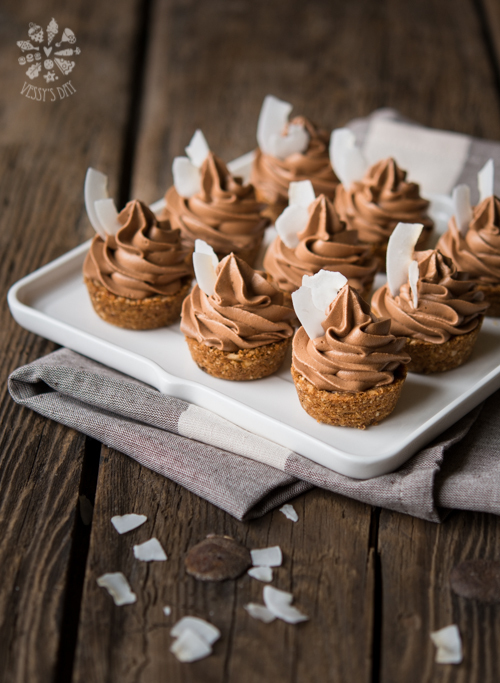 Crispy coconut cups, filled with creamy chocolate mousse. I remember preparing these coconut tartlets and thinking how flavorful they are. I was drooling all over from the minute I mixed the batter. Somehow just a few simple ingredients can turn your whole kitchen into a dream of coconuts, palm trees and blue skies. Well, no matter what the real view from your kitchen window is, these coconut bites will make your day a little brighter and flavorful. Recipe is easy and pretty quick, so there’s no reason not to have these on your table tomorrow. Combine all ingredients in a medium bowl. Mix until butter is evenly distributed and mixture looks like moist sand. Grease a 24 mini muffin tin with vegetable oil. Distribute the mixture evenly between the muffin cups. Using your fingers gently press the mixture onto the sides and bottom of the muffin cups, forming small “baskets”. This is the part where you will want to eat the biscuit mixture before even baked, cause it smells so good, coconut-y and sweet. Bake for about 15 min or until slightly browned. Remove from the oven and set aside to cool completely then put in the freezer for 30 minutes. Once the cups are firmed in the freezer, it will be easier to remove them from the muffin tin. Use a small spoon or a knife to take them out of the tin. Arrange all cups on a serving platter and set aside until ready to filled with the chocolate mousse. In a small bowl combine the chocolate and 60 ml. of heavy whipping cream. Heat t in the microwave oven until cream is so hot that the chocolate starts melting. Stir with a small spoon until the chocolate melts and the mixture is glossy and smooth. Set aside. In a medium saucepan whisk the egg yolk and sugar until pale. Add vanilla extract and start cooking on medium / medium-low heat (depending on how strong your stove is). Whisk almost constantly until sugar dissolves and the egg yolk mixture is hot to the touch. Cook egg yolks on medium low heat until you temper them, then you can turn the heat up a bit and continue cooking until the mixture thickens. Make sure to whisk often to avoid curdling the eggs. Once the sugar dissolves and the mixture is thickened, remove from the heat and add the chocolate-cream mixture. Stir until all combines and the mixture is smooth. Set aside. In a medium-size bowl whip 80 ml. of heavy whipping cream until soft peaks form. Don’t over-beat the cream, you need it with soft peaks in order to get a smooth and light as an air mousse. Fold in the heavy whipping cream to the chocolate mixture and gently stir with a rubber spatula. Fill in a piping bag with a tip of your choice and pipe the chocolate mousse over the coconut cups. 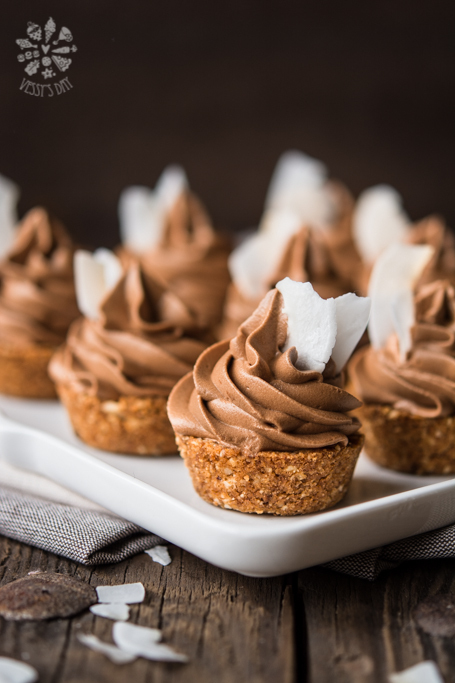 NOTE: On their own, coconut cups have a crispy texture, but once filled with the chocolate mousse they soften a bit and loose their adorable and super delicious crispiness, so I would recommend you to fill the cups with the chocolate mousse just before serving, in order to keep the cups crispy. I believe this is one of the great things about this recipe – it combines crispy, flavorful base and smooth, creamy mousse.